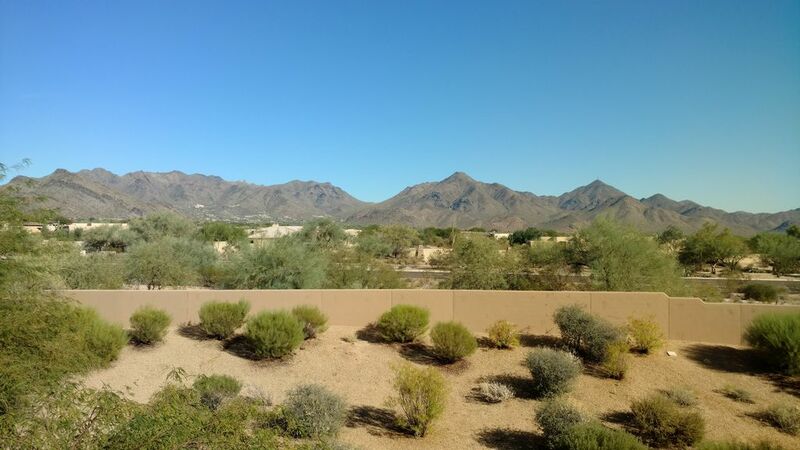 Grayhawk / DC Ranch Area-3 BDRM 2 BA Condo avec une vue spectaculaire sur la montagne! Unité au 2ème étage paisible avec vue panoramique sur la montagne. Proche de tout. Récemment mis à jour 3 condo 2 salles de bain 1700+ condo avec tout le confort de la maison et plus. Directement adjacent au club de golf Grayhawk. Notre développement est considéré comme l’une des meilleures communautés de villégiature de North Scottsdale. (Liste des commodités ci-dessous) Avec le quartier commerçant plus fin à proximité de Market Street, vous aurez tout ce dont vous avez besoin à 10-15 minutes à pied. Cela comprend les achats d'épicerie, les restaurants et autres magasins spécialisés. À quelques minutes en voiture, vous accéderez aux meilleurs terrains de golf du pays: Grayhawk, Pinnacle Peak, Troon, TPC et Kierland. Ces terrains de golf sont tous situés à 5-15 minutes en voiture. Si vous aimez la randonnée, McDowell Sonoran Preserve Trailhead et Pinnacal Peak Park se trouvent à seulement quelques kilomètres. Allez un peu plus loin en voiture et découvrez les roches rouges de Sedona ou du Grand Canyon. Linge de toilette fourni pour votre commodité. We had a great 8-night stay here. The condo was beautifully decorated, very comfortable, had everything one might need and more! Beds were comfy, linens/towels were very nice, kitchen had everything we could need and more. Our two kids absolutely loved having their own bedrooms, each with their very own TVs. Location was great - near restaurants, shopping, and great hiking (Pinnacle Peak). The heated pool and spa were very nice and just a short walk from the unit. Nice views of the McDowell Mountains. Nothing was overlooked in preparing this beautiful condo. Bob was a pleasure to work with, and was very responsive to our questions. All in all, we had a wonderful vacation, and would very highly recommend this condo. We hope to be back next year!! Thanks Bob!! We enjoyed our stay in this pleasant, comfortable, and tastefully decorated condo in a convenient area of Scottsdale. The unit was clean and well-equipped. We especially enjoyed the panoramic mountain views from virtually every room in the condo. There are many restaurants nearby in the DC Market. Bob's beautiful condo was very comfortable and had everything we needed to prepare food and relax and enjoy our time away. The location is perfect for our love of golf and the Grayhawk golf courses. Also, it was easy to get to all the areas we like to go as we have been coming to the Scottsdale area for the past 15 years each February for a couple of weeks. Highly recommend this condo for a relaxing getaway. Awesome condo with great access to restaurants, hiking and events. This is our second year at Bob’s condo. We love it. It’s close to Market Street and all the hiking we love. The view of the mountains from the living room is outstanding. I love the kitchen. It’s well stocked and makes it easy for me to cook. Kathy, thanks for your return visit. We thank you for staying with us again and we look forward to your next visit. The accommodations were perfect for four adults.Equipted with everything we could have needed. Very clean and equipped with everything we could have needed.Bob's notes were very helpful. Good location to shopping. The pool area and work out room very nice. We plan to stay here again. Nancy, it was a pleasure hosting you. Thank you for the kind words. We look forward to you next stay. This place is wonderful–we loved everything about this well appointed condo. It was spacious enough for my family, beds were SUPER comfortable and the decor is beautiful. We loved the views, and the location is great. It's close to great restaurants and grocery stores if you want to cook at home. The nearby scenery is breathtaking, and we couldn't have had a better time. Bob was very helpful and great to work with, he clearly takes pride in his home. We absolutely will be staying here again. Thank you for the great comments. You and your family are always welcome back. The cleaning crew said my place was the cleanest they ever saw it after someone stayed there! Notre développement est considéré par beaucoup comme le meilleur développement de la station North Scottsdale. Ce condo de 3 chambres est situé au milieu de celui-ci! Il a tout ce dont vous aurez besoin à distance de marche ou à 5-10 minutes en voiture. Shopping - Comprend achats de tous types ainsi que de nombreux restaurants de occasionnel à la gastronomie. Piscine, 2 Hot Tubs, basket-ball, tennis, salle de fitness. A $50 refund will be provided if you rate your stay on VRBO! Spring Break, Thanksgiving, Christmas and New Year's weeks will be offered at a higher rate if not renting for the month. Any stay containing Super Bowl Sunday (February 1st 2015) will incur a premium.